City Repair "facilitates artistic and ecologically-oriented placemaking through projects that honor the interconnection of human communities and the natural world." ​Their annual event, the Village Building Convergence, is a 10-day event filled with community building, permaculture, creative placemaking & urban design. It includes intersection painting, natural building, cutting edge workshops, presentations, and innovative evening programs that nurture connection & participation. T-crab is the newest addition to City Repair's fleet of tea carts and serves as a space to gather and build common ground. It is an ephemeral, or temporary, structure that supports the placemaking movement -- an approach to the planning, design and management of public spaces. Placemaking capitalizes on a local community's assets, inspiration, and potential, with the intention of creating public spaces that promote people's health, happiness, and well being. Of all of City Repair's placemaking tea carts, T-Crab is the first bike-powered tea house. It is made out of steel frames, spans up to 30-40 feet, then folds back in to be pedalled to other locations. City repair's theme for Village Building Convergence 2017 is "HOME." faced inequity ​and to those who can lose their home through deportation or gentrification? ​And what does having a home mean when we are houseless? on basic humans rights ​and what it means to have a sense of home. During this year's VBC, T-Crab will be making a presence at a few event. 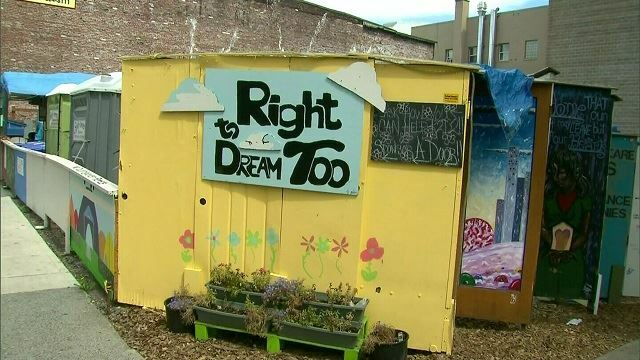 One will be a Pedalpalooza ride with Right2DreamToo, a nonprofit providing safe places to rest for the Portland houseless community since 2011. They are in the midst relocating and are in need of support in the process. Bike trailers of all kinds will be there to help with the move, T-Crab will be leading the ride down to the new location where there will be and tea will then be served. T-crab will also be joining the annual Pitch-a-Tent event held by Right To Survive. 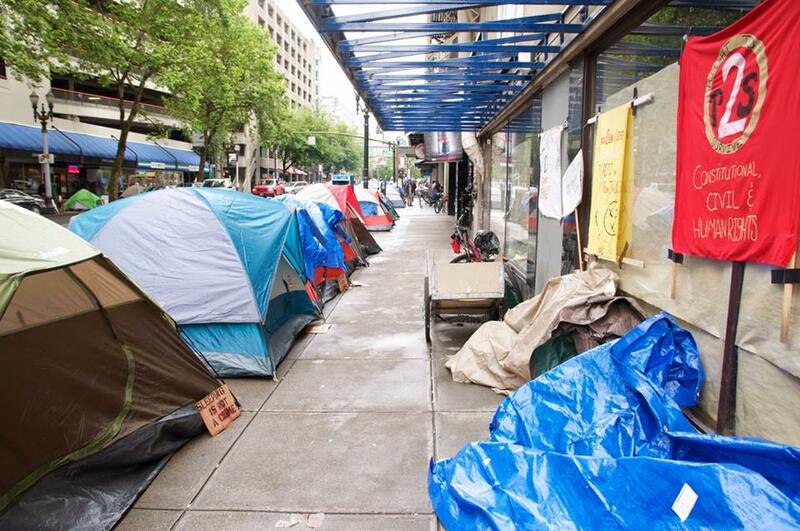 This is 24-hour public camp out designed to raise awareness about the criminalization of houselessness in Portland. It calls attention to the hypocrisy and brutality of criminization of survival camping. Right To Survive speaks out on the injustice of punishing someone with criminal penalties simply for exercising the human need for sleep. ​While having a mobile tea cart to create places to share tea and time together is fun and great, is there a deeper purpose? Is this just another privileged project to build "community"? Initially, while working on this project, something felt like it was missing. A more meaningful story of the T-Crab was not being effectively conveyed. The VBC theme was there, the placemaking was there, but it felt that the greater purpose took a while to fully come through. My hope is that future events with the T-Crab will continue to be more focused on bringing awareness to issues around houselessness. Inspired by a recent trip to Human Solutions family shelter, the work of Right2DreamToo and Right To Survive, and this year's VBC theme, the idea of home for me conjures up the idea of sleep — a safe place to rest, a warm place to dream, a comfortable place to wake up. The simple luxury of having a sense of home and a bed to retire to at the end of our day is often taken for granted. It is however, an essential human need and a deeply nourishing human right. My roles with the T-Crab project were varied and flexible. It included: making flyers, organizing events, procuring items, promoting, networking, fundraising, and tabling.